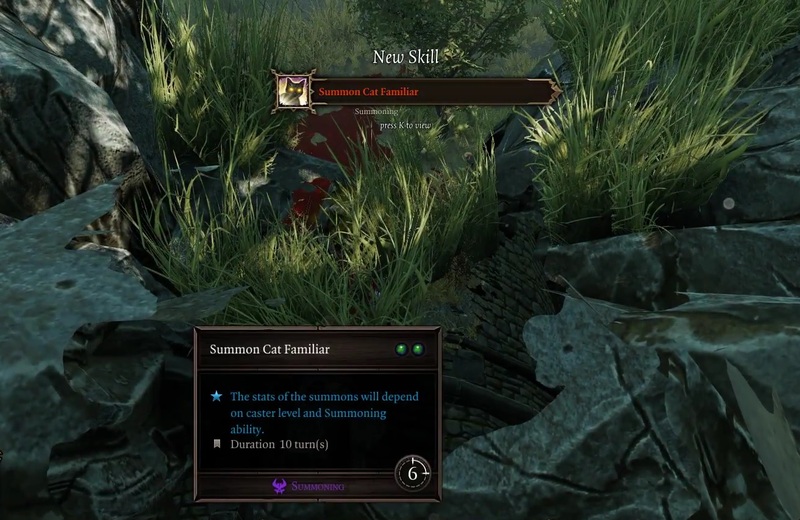 Save the black cat to get the Summon Cat Familiar skill in Divinity: Original Sin 2. Shortly after arriving at Fort Joy in Divinity: Original Sin 2, you will come across a black cat near the beach. While its motives may seem unclear, we do know that you can save this black cat from an untimely demise if you know what to do. This guide will explain how to save the black cat in Divinity: Original Sin 2 and what you get in return for doing so. This mysterious black cat is located just beyond the Fort Joy Ghetto, not far from the rocky outcropping where you met the Red Prince for the first time. Follow the path southeast until you run into a stray black cat. This peculiar cat will begin to follow around the first member of your party it sees. It will join your party, but won’t take up a member slot. 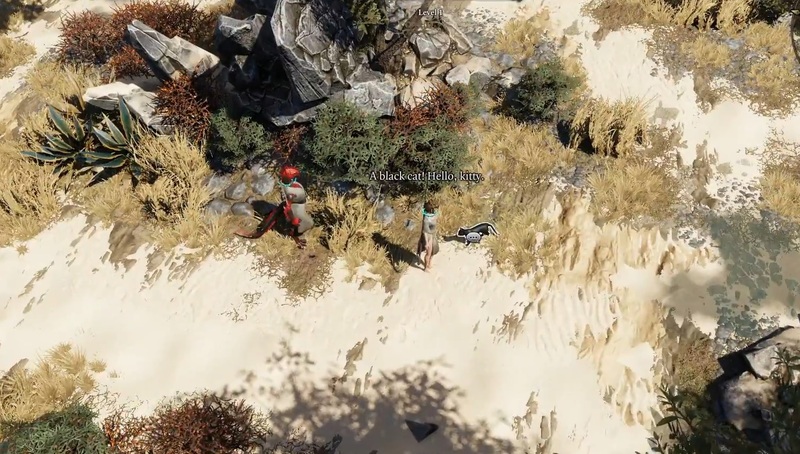 Like all animals in Divinity: Original Sin 2, you can speak to the black cat using a character that has the Pet Pal talent. However, you won’t learn much other than that the cat is apparently confused. Avoid the Magisters - The Fort Joy guards are the biggest threat to your furry companion. They will quickly shoot an arrow into the black cat if given the chance, so be sure to maintain a safe distance from the magisters, especially those along the east side of the prison. The Black Cat Will Run from Combat - If you enter combat while the black cat is with your party, it will flee from the fight in real-time to find safety. The cat will return to its chosen party member after combat. However, sometimes the cat will sneak away through one of the exits. After battle, go through the exit that the cat took, and it should spawn next to you. Speak to it again to have the black cat rejoin the party. Cats Don’t Teleport - Fast traveling won’t work on the cat, even while it’s in your party. If you must use an altar to travel somewhere, you’ll need to return to the initial altar where you left the cat to find it again. Look for the Yellow Dot - The black cat is signified by the yellow dot on your minimap. If the black cat happens to get away from you or disappear, check the map first to see where its yellow dot may have gone. Once you have the black cat in your party, continue playing through the main objectives in Divinity: Original Sin 2 to escape Fort Joy and reach The Hollow Marshes. Upon successfully escorting the black cat out of Fort Joy, it will become a familiar for either you or the Red Prince. You will also receive a pair of spells that allow you to summon the black cat. Escaping Fort Joy with the black cat will grant you the Summon Cat Familiar Skill. As a token of appreciation, the black cat will grant you the Summon Cat Familiar skill, which consists of two spells: Feline Leap and Swap Places. Feline Leap allows you to summon the black cat to jump to a location during combat. The Swap Places spell causes the black cat to teleport and swap places with its master. Having the black cat as a free teleportation skill can be very useful in battle, especially when you need to get a party member out of a tough spot or simply want to reach areas that are normally inaccessible. Now that you know how to save the black cat in Divinity: Original Sin 2, you should be able to get a free set of spells just by keeping the little fella safe.